Have you ever noticed that some recipes will just call for eggs in general - "two eggs, beaten", whereas others specify the size of the egg - "two large eggs, beaten"? Likely if you are reading a recipe where the egg size is specified you're baking rather than cooking. Even if each recipe doesn't specify, recipe books for baked goods will often clarify somewhere in the book that "egg" means "large egg". I've never seen a recipe call for any other size of egg, but despite this fact, if you roam the aisles of a supermarket, you will find eggs ranging in size from peewee all the way up to jumbo. So, let's discuss. Is it problematic to sub in one size of egg for another? What is the significance of eggs sizes? How important is the role that eggs play in baked goods? I spent about a year working in the kitchen at a brewery, and it was then that I learned of the importance of egg size standards. I'm sure if any of my coworkers from the brewery kitchen are reading this blog, they are rolling their eyes right about now. I may or may not have spent a good amount of time at work weighing each egg individually and mumbling under my breath about egg size standards. You know. It might have happened. One of the most popular items on the Sunday brunch menu at the brewery was chicken and waffles. In preparation for the ravenous brunch crowd, I would make a huge batch of waffle batter every Saturday night. When I say huge, I mean three dozen eggs per batch. We would purchase all of our eggs from a local vendor at the farmer's market. I just took it for granted for quite some time that the eggs were the standard large, but I felt like the batter was runnier than it should be. I remembered reading standard egg sizes somewhere, so I weighed a few of the eggs. 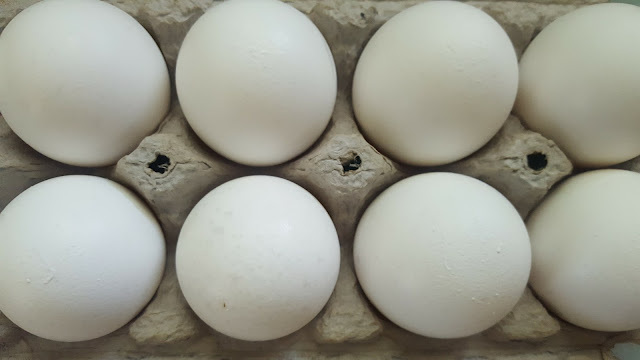 Once I started weighing the eggs, I found that even though the cartons were labeled as large, the eggs individually weighed anywhere from 2.4 to 2.6 ounces. Egg weights in the US are mandated by the USDA. Every country has its own egg weight standards, so depending on what country your cookbook originates from, you and the author could be on a very different page (haha) when it comes to eggs. Below are the standard egg sizes as per the USDA. The egg (shell included) must weight at minimum the listed amount to fall into the corresponding size classification. Personally, I have never seen a peewee sized egg. I don't know what kind of tiny chickens lay them or where they are sold. I've never seen them for sale at my grocery store - what about you? If you have experience with peewee eggs, I'd love to hear about it. Knowing the standard egg weights can save you a lot of headaches, guesswork, and frantic googling. A scale is extremely helpful in this situation but even if you don't have one, you can still figure out how many medium/extra large/etc eggs to substitute with a little algebra. If you're buying eggs from a farmer's market or a friend with chickens, I would highly recommend weighing the eggs before just tossing them in the bowl. 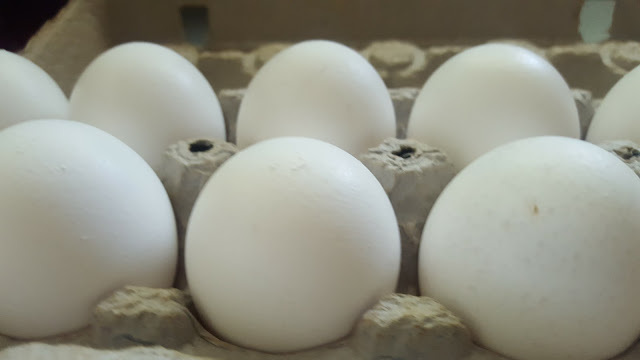 If you want to weigh your eggs but have already started cracking them, it's also helpful to know that a large egg out of the shell weighs approximately 1.7 ounces. The important of weighing your eggs is a topic near and dear to my heart. I could actually go on about it for quite a while. However, for fear of extreme repetitiveness, it may be best to move on. Let's take a step back to a more general look at eggs and the role that they play in baked goods. Eggs make a large contribution to the final structure and texture of baked goods. You may have noticed that some recipes call for just the whites or the yolk, or maybe something like two whole eggs and two yolks. This is because the yolk and white have very different effects on baked goods. The yolk of an egg is composed of fats and vitamins and nutrients whereas the whites are laden with protein and water. For a richer, creamier food, you will look to the egg yolks. If you're baking a cake that calls for all yolks or extra yolks, it will likely have a velvety texture and rich flavor. Egg yolks are also indispensable in two other cooking techniques: emulsification and thickening. Have you ever made mayonnaise or aioli? To do so, you slowly drizzle oil into a mixture of some kind of liquid, egg yolks, and flavorings/spices that you are beating either by hand or in a food processor. As you drip the oil in, the egg yolks absorb the oil and the entire mixture begins to thicken, as though by magic. It is not magic though, it is the emulsion process! The egg yolks are the binding agent that allow the liquids and fats to stably coexist. The combination of blending at a steady pace with the slow addition of the oil causes the liquid and fat elements to become suspended within each other in an even dispersement. 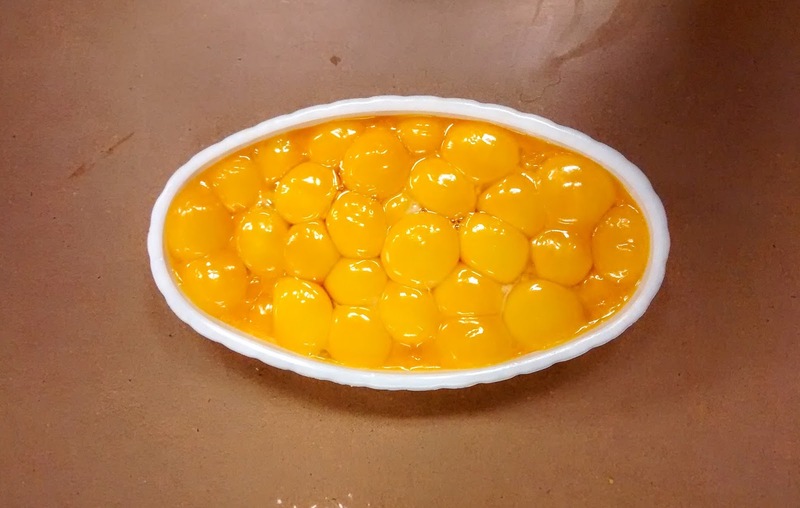 The egg yolks are the emulsifier - because they have both hydrophilic and hydrophobic properties, they act as a catalyst for the mixture to become one cohesive unit. When you use egg yolks to thicken a sauce or curd, they not only serve that purpose but also add that rich flavor (as opposed to using cornstarch, which adds that cornstarch flavor. Yikes). The thickening occurs because as the yolks are gently heated, the proteins in them loosen up, unfold, and begin to gel together. The process is pretty simple - you just mix all of your ingredients together with the yokes and slowly cook them over low heat while stirring constantly. Both of those steps are very important. If you don't stir constantly, you'll end up with scrambled egg soup. Gross. If you turn the heat up too high, the egg yolks may curdle. Some recipes that use egg yolks as thickening agents actually direct you to use a double boiler, which pretty much guarantees that the heat will be applied gently (unless you're using the double boiler incorrectly). Whether you're using the double boiler or putting your pot directly on the heating element, make sure you mix the egg yolks with the other ingredients (unless the recipe directs otherwise) so that there's an even lower chance of scrambling. If you're using frozen berries to make a curd, make sure to thaw them before mixing them in with the egg yolks so that you don't end up with frozen yolk. Not like I'm speaking from experience or anything. Normally I consider thawing a pretty skippable step, but not in this case. If you're worried that your sauce/curd is not thickening, inch up the temperature slowly. Just as it gets under a simmer it will suddenly thicken almost instantaneously. At this point it is imperative that you are stirring constantly or your sauce will be lumpy. Lastly, if you still feel that the sauce is not thick enough after passing this step, don't worry. It will thicken considerably as it cools and even more so if/when you put it in the fridge. Now that we've covered egg yolks fairly thoroughly, let's briefly talk about egg whites. Most of the time when a recipe calls for only egg whites, it also directs you to whip them up and then gently fold them into the batter. 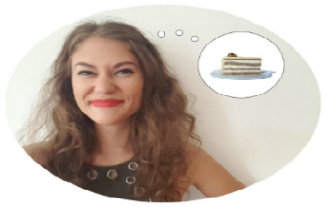 Meringues, macarons, and pavlovas are excellent examples of this. When egg whites are beaten into a frenzy, they create a foam that does an excellent job of providing both volume and stability to a baked good. This is because when you beat the egg whites, you incorporate air into them. When the air is incorporated in, the proteins in the whites begin to unwind. 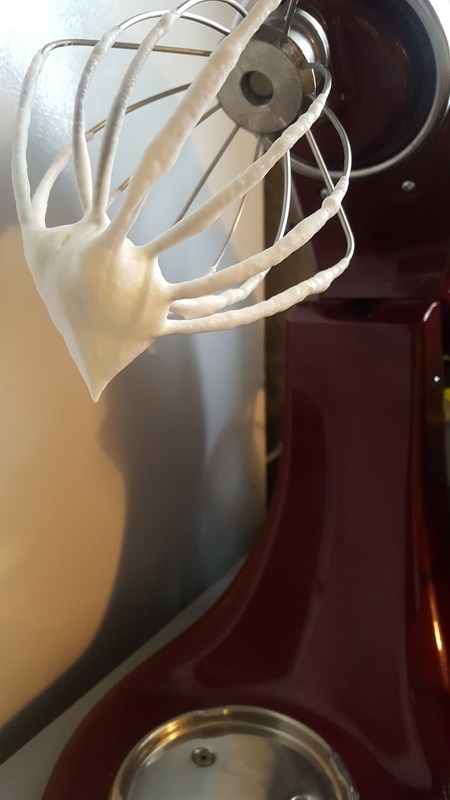 They are very stretchy and they encase the air bubbles, which provides the volume for the baked goods. Egg whites can actually expand up to eight times their original volume. When the encased air bubbles are heated, the gas within the air expands from the heat, which causes the batter to rise. As the batter continues to heat, the network of proteins solidify around the expanded air so that when the bubbles eventually burst, the structure remains solid and your cake has risen beautifully! If you have any questions about eggs and their contribution to baked goods, let me know. I can't promise to know everything, but I've picked up a few tricks along the way. Also, when people ask me questions...it gets me curious to learn more. So, ask away! How can one use a double boiler incorrectly? People can do anything when they put their minds to it, my friend.